An aspiring country singer (Ferlin Husky) and his buddy (Don Bowman) head to Las Vegas, where Husky takes over a debt-ridden dive bar he’s inherited from his deceased uncle. With help from bar-singer “Boots” Malone (Mamie van Doren) and local phenom “Tawny” (Jayne Mansfield), Husky and Bowman attempt to revive the joint by bringing in top-name country music talent. 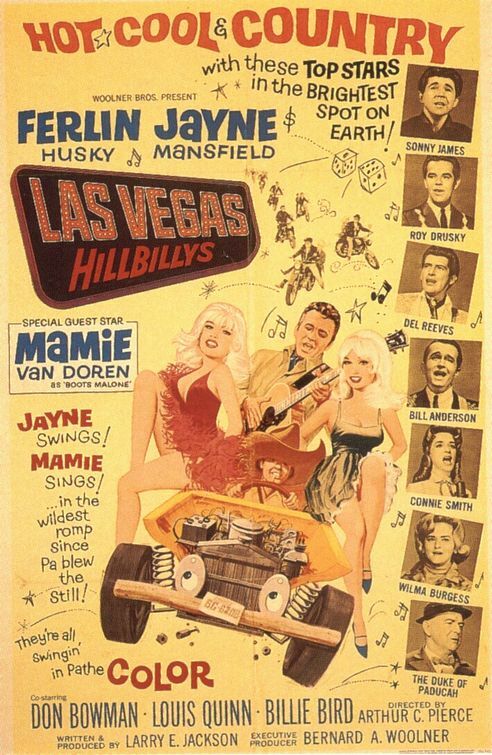 It’s unclear why Peary lists this “Hee Haw” precursor in his GFTFF, but my guess is he couldn’t resist including the only film “co-starring” two of the “Three Ms” (Marilyn Monroe, Jayne Mansfield, and Mamie van Doren) — though Mansfield and van Doren apparently detested each other enough that doubles were used in the one scene in which they appear together. M&M do what they do best — flaunt their curves, their vocal pipes, and their outsized personalities — but otherwise, this flick is really just an excuse to incorporate a number of singing performances by current country music stars (including Sonny James, Roy Drusky, Del Reeves, Bill Anderson, Connie Smith, Wilma Burgess, Duke of Paducah, Junior Carolina Cloggers, the Jordanaires, Don Bowman, and Lois Quinn). The slim-to-none storyline utilizes every possible opportunity to make fun of “hillbillys” (dilapidated cars, burning hooch stills, drawling accents) while also demonstrating their tenacity and family ties (“Aunt Clem” — Billie Bird — comes to the rescue near the end). Watch for a “cameo” by Richard Kiel (“Jaws” in Moonraker) as, of course, a hulking bodyguard. No; this one’s strictly for fans of van Doren, Mansfield, or country music of the era. First viewing. Totally forgettable, very tacky on its low budget and clumsily handled all round – even the music is meh (even if you’re a country music fan, I would think). Basically harmless and it does seem to mean well – but skip it.